Solve this genius math puzzle! Difficult Logic math puzzle image only for geniuses with the solution! Hi, Here is an another interesting logic puzzle for you guys. 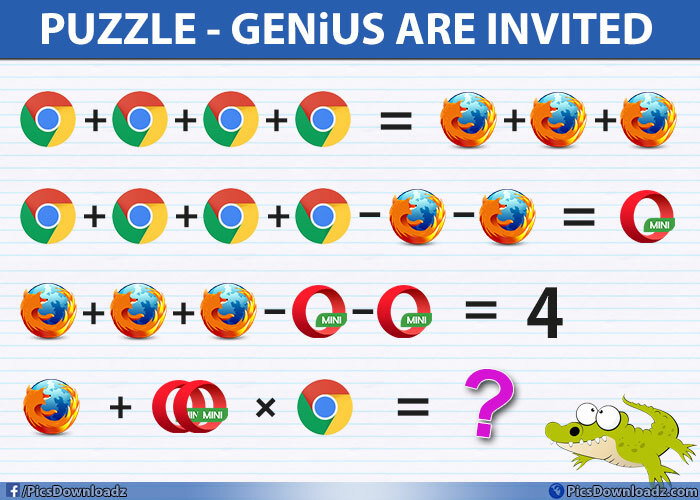 In this puzzle, you will have to find out the value of these given browsers images and put their value in the last equation and solve it. Check this puzzle question and image below and share your answer in the comment section. Best of luck! ⇒ Firefox + 2 Opera × Chrome = ?? Share this puzzle with your friends on facebook or whatsapp. Let see, if they can solve this puzzle or not and don’t forget to follow us on facebook for more puzzles and interesting stories. ⇒ 4 + 8 × 3 ⇒ 4 + 24 ⇒ 28 Answer.